Click here - Thanksgiving weekend sales, online + retail, estimated to be down 11% against a comparable weekend last year (same number of weeks before Christmas). Stores were open Thanksgiving, more and longer than last year. Omnichannel should increase sales, right? Weren't amazingly low gas prices supposed to turbo-charge customer demand? Mobile ... aren't customers shifting to mobile? If so, wouldn't that result in a sales increase? I guess mobile is cannibalizing e-commerce & retail. Hmmmm. Something to think about. The National Retail Federation cheered the results, calling the times "exciting" (click here). They're right ... it is exciting when sales drop by more than 10% ... unless you are a VP at a business experiencing the sales declines. It's not exciting when your job is at risk. There will be breathless cheers for "record" Cyber Monday performance today ... but add a "record" Cyber Monday to Thursday-Sunday, and you'll still see a sales drop. We made three mistakes, mistakes that we all must try to fix in 2015. We spent a decade telling customers to sit at home and click. It worked!! It's hard to sell merchandise in a store when you repeatedly, five times a week, for a decade plus, send emails telling the customer to click. Tell the customer 2,500 times over ten years to stay at home (imagine that message multiplied by a dozen retail businesses over a decade saying the same thing ... 30,000 messages), and the customer might start to listen. And now, we've trained the customer to avoid Black Friday by shopping on Thanksgiving or Cyber Monday ... so now we generate less sales over five days than we used to generate focusing on one day. Retail is boring as heck. By investing in the online experience, we ignored the in-store experience ... and there is no reason to shop in a store if it isn't fun ... online (Amazon) is eating up anything that is "boring". It's time we fessed up to this fact and did something about it. We ignored merchandise. We assumed the merchandise was fine and that pricing was wrong. We should have realized that the merchandise was not fine, and that's why discounting had to happen. We must invest in merchandise and experience in 2015. We're more than capable, folks - we can easily fix this problem over the next two years. We're talented. We just need to shift our priorities away from activities that make our business partners profit, and instead focus on the merchandise that generates profit for us. If we do that, our business partners win, and we win. You see this one repeat all the time. New+Reactivated Buyers, November-January = +5%. New+Reactivated Buyers, February-October = -20%. New+Reactivated Buyers, Annual = -7%. When you drill down into the numbers, you uncover two really uncomfortable findings. First, November-January buyers are much less likely to pay full price than February-October buyers. Second, November-January buyers are much more seasonally oriented than February-October buyers, who happily buy during all calendar months. Over the past five years, businesses ramped-up the November and December machine (Cyber Monday! ), and greatly increased the presence of January as a clearance / liquidation month. Customers responded, in earnest. Then we wonder why customers won't purchase during the rest of the year, when we try to push full price, non-seasonal merchandise? Use your diagnostic framework to identify if this is happening in your business. Run the queries! Contact me if you can't get the work done (kevinh@minethatdata.com). In the old days, when retail comps were acceptable, companies broke out direct channel sales and retail sales - separately. In the modern era, with retail comps tepid at best, companies add total direct-channel sales to the comp store sales measure, and for good reason. E-Commerce Last Year = $1 Million. E-Commerce This Year = $1.2 Million. Retail Last Year = $10 Million. Retail This Year = $10 Million. Total Business Last Year = $11 Million. Total Business This Year = $11.2 Million. I know, I know, the experts will tell you that, in an omnichannel world, you have to add the two metrics together. Fine. But the modern metric hides retail weakness. So if you're going to do this, you must find a way to clearly articulate the weakness evident in in-store retail performance. Think carefully about the future, a future where e-commerce performance increases, but increasingly, there's fewer and fewer people shopping in a physical store. I'm not talking about a store going from $1.5 million in annual sales to $0.5 million, that won't happen. All it takes is the store going from $1.5 million to $1.3 million for all sorts of interesting dynamics to happen - just ask your CFO. Another breathless article suggests that this e-commerce business is moving into retail, and is doing amazingly well (they are). Click here to enjoy. The vast majority of retailers would love to enjoy the luxury of $3,000 per square foot. Catalogers know how this process works. If a cataloger only mailed a November catalog, that catalog would generate $15 per book. But when a cataloger adds the 28th catalog to the calendar, it generates $3 per book. The law of diminishing returns is alive and well. Catalogers know the square footage game as well ... in catalogs, it's square inches. Have a 64 page catalog, and you get $60 demand per thousand pages circulated. Have a 128 page catalog, and you get $40 demand per thousand pages circulated. The law of diminishing returns is alive and well. Established retailers know how this process works. Your first store in the New York City market generates $500 per square foot ... your tenth store in the New York City market generates $250 per square foot. The law of diminishing returns is alive and well. Warby Parker deserves praise for earning $3,000 per square foot - you go and try to achieve that level of productivity - it's not easy. The challenge for Management, of course, is to forecast what happens if the size of a store were to increase (this store is less than 1,600 square feet - very, very small), and as the number of stores within / across markets increase. That's hard work, because with one data point, you can draw a line from the data point to anywhere. Major, major props for good performance. Major challenges forecasting what happens next. And your mileage will vary. If you are in the catalog world, you know that I will be participating in a day long presentation about the future of catalogers / e-commerce businesses and those who look out for your interests (in Concord, NH, on February 19, 2015 - click here for preliminary details). The day-long event is hosted by Datamann - it's a non-selling event, for those of you who are interested. I assembled a series of notes that may or may not be used during my presentation, the slides represent my initial thoughts. I'd like for Catalog Executives and Catalog / E-Commerce / Retail Employees to click here and thumb through the notes. Please give me some feedback - what do I need to cover that you think is missing from the notes - where do you think I'm aligned with your thoughts - where do you think I am completely missing the boat? What would you like for me to share about the future of our industry? What are the business challenges you want for me to address? Again, this is not the presentation ... these are the notes that will form what ultimately becomes the presentation. As I learn more, and receive your feedback, I'll modify the content. Then send me an email (kevinh@minethatdata.com) with your feedback, suggestions, and thoughts. We hear a lot about income inequality, don't we? Often, among the retail, e-commerce, and catalog businesses I analyze, I also observe interesting dynamics that have parallels to what is happening out in the real world. Back in the 1990s, I worked at Lands' End and Eddie Bauer. Both businesses generated disproportionate profit from what I would call "middle class buyers". My definition is not based on income, it's based on annual purchase frequency. All businesses have elite customers ... those who purchase 5+ times a year. A nice chunk of profit comes from this small group of customers. 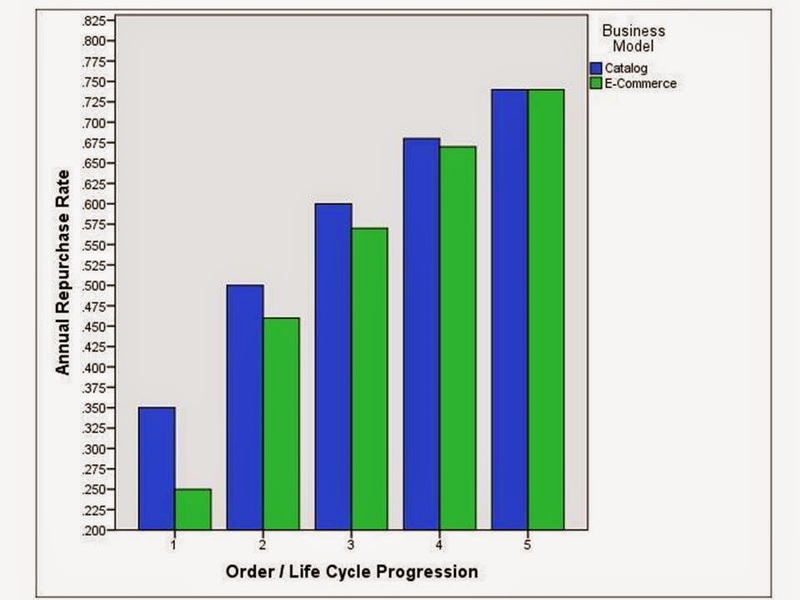 All businesses have a glut of unproductive customers ... those who purchased one time in the past twelve months. The secret here is to be able to generate profit on just the one transaction ... something that catalogers find increasingly difficult ... something that e-commerce brands are easily able to accomplish. The middle class, then, are customers who purchased 2-4 times in the past year. These folks contribute above-average levels of profitability. We all need a healthy middle class, in order to achieve 10% pre-tax profit. In recent years, the middle class is shrinking. Here's a common outcome, when I run a query on percentage of buyers by purchase frequency, across the past decade. 1x buyers are increasing in share. 5x+ buyers are increasing in share. 2x - 4x buyers are decreasing in share. This is a logical outcome of a multi-channel / omni-channel strategy. What happens, of course, is that all the attention is centered around the "best" customers, so long as the best customers shop multiple channels. The strategy appeals to this small subset of the population. Unfortunately, the strategy does not appeal to the "middle class" ... customers who are merchandise-centric, and not channel-centric. 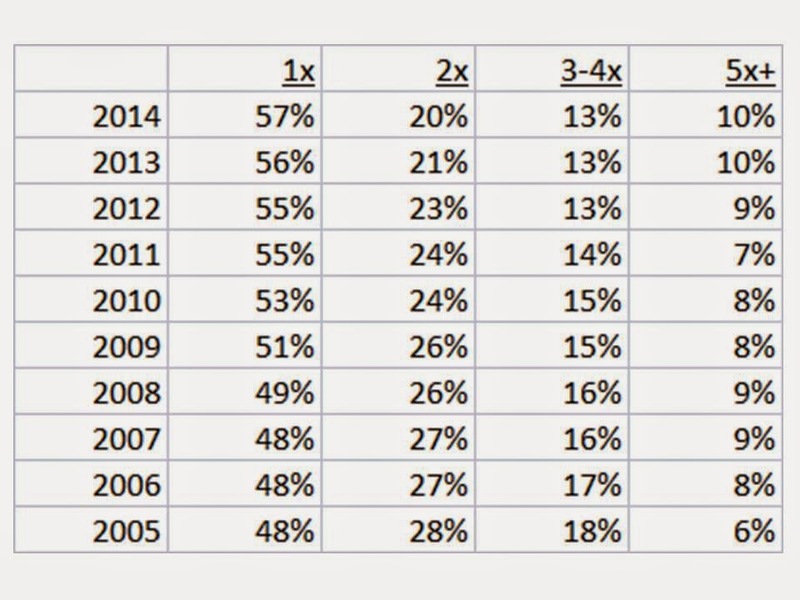 These customers, over time, become less and less thrilled with the direction of the business (especially as retail begins to limit the assortment - focusing only on best sellers in stores), and purchase less often, falling into 1x status (per year) at greater rates. The net of all of this activity is often nothing ... you lose sales from the middle class, you gain sales among hyper-loyal omnichannel buyers, yielding the same financial outcome. Eventually, though, these business models are starved from the outside ... too few new buyers ... too few reactivated buyers ... and when new/reactivated buyers purchase, they are 1x buyers with lower long-term value. Run the query - see if this is happening to your business. It's my opinion that while a majority of businesses chase omnichannel endeavors, a minority of businesses will figure out the merchandising reasons the "middle class" buy from a business, and will thrive. I've talked about this before, but it is important to share with you once again. Catalogers went through this change, from 1995 - 2005. The majority of sales happened in the call center. And then, over a ten year period of time, sales leaked out. Slowly. Customers shifted online. By the time The Great Recession arrived, the customers who were inclined to shift online had done so, leaving the call centers "as is", serving a different customer demographic. This same dynamic is happening in retail, albeit much slower, and with very different consequences. Run this query. Identify all customers who bought in a retail store in 2013 (year ending November 19, 2013). Then, among all customers in this segment who purchased in 2014 (year ending November 19, 2014), calculate the percentage that also purchased via e-commerce. Re-run this query for the past decade. Now, the omnichannel community loves seeing metrics like this. To them, it's proof that omnichannel works ... customers are migrating online, and that has to be a good thing. Well, there's nothing wrong with channel shift. Customers should do whatever they want. The problem, of course, is that when you review your customer file in total, you notice that annual purchase frequency is not increasing. By and large, we're just moving customers back and forth across channels, spending more money to do so. Worse, we're driving less traffic into stores, meaning that long-term, the stores are going to appear to be unprofitable. Run the query. Tomorrow, we'll talk about another query you should run. Combined, the two queries help us understand whether our omnichannel efforts resonate with the customer, or with vendors. I'm not a catalog shopper, folks. I was, back in 1999. For me, e-commerce became the primary way to purchase merchandise, and then, Amazon. I doubt I'm alone, among those under the age of 50. So here I was, this afternoon, exactly nine days prior to Thanksgiving, walking to my mailbox. I remembered the twenty years I spent measuring in-home date effectiveness ... "don't be in-home the week of Thanksgiving" ... "Monday-Wednesday is a better in-home window than Wednesday-Friday" ... blah blah blah blah blah. Of course, it's 2014 now, not 1999. You have choices. The omnichannel folks will tell you that you have infinite choices. And they expect you to utilize the veritable buffet of choices at your disposal. It's how they get paid. So why, when I go to the mailbox today, do I obtain a fistful of catalogs, all mailed on November 18, in observance of all established catalog best practices? 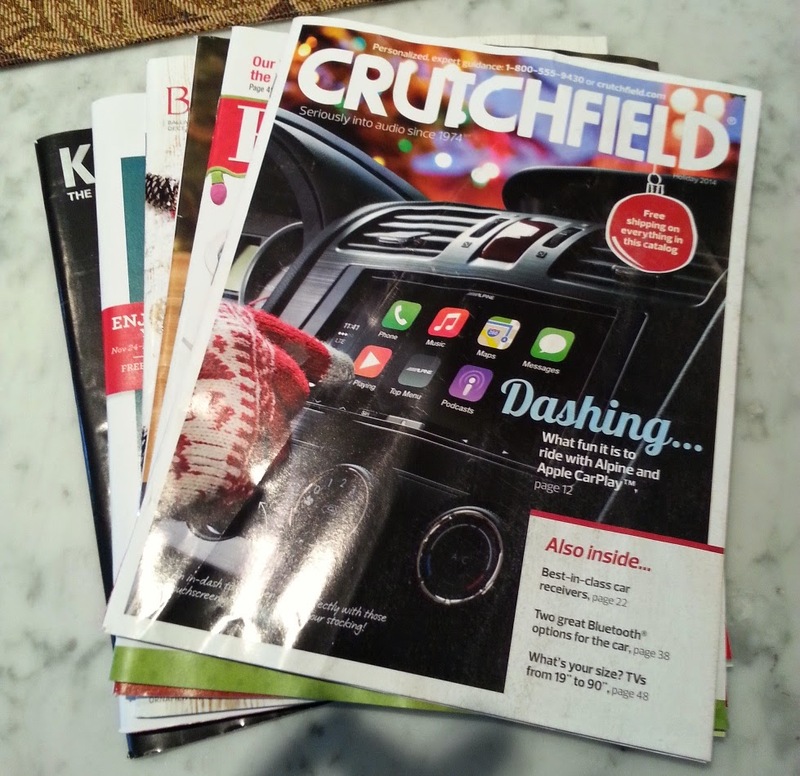 My goodness, how many catalogs do you think the 68 year old retired school teacher living just south of Buffalo received today (assuming that the customer could get to the mailbox amid 70 inches of snow - click here)? I'm not a catalog shopper, and yet, catalogers are pummeling me. I can fix that problem among housefile buyers (kevinh@minethatdata.com if you're interested). Only co-ops can fix the problem among prospects, and there's a financial disincentive for them to fix the problem. Creativity and Original Thought: Best practices are not best practices - they're lazy tactics that eliminate creativity. I realize that you've mailed a catalog for thirty years nine days prior to Thanksgiving. I realize that it's easy to pencil in this in-home date when creating your 2015 plans. Why not try to demonstrate some creativity? At minimum, why not extensively test different ideas? If you test, and you find that being in-home nine days prior to Thanksgiving is best, then you're well ahead of the curve. Seldom do you read anything practical. But then you find this article (click here) from The Economist. An e-commerce brand moving into retail is not proof that retail is the right move. It is, however, a blatant acknowledgement that growing the customer base via an e-commerce-only business model is really, really hard, and has a ceiling for most. I've mentioned, on numerous occasions, that The Story Of The Fall is the inability of businesses to reactivate lapsed buyers, or to acquire new buyers. Nowhere is this more acute than in e-commerce. Remember this graph? When comparing catalog and e-commerce business models, I usually observe that the e-commerce business model struggles to convert the first time buyer to a second purchase. Worse, with a low annual repurchase rate (from 1st to 2nd purchase), e-commerce business models churn through customers at a much faster rate than catalog (and retail) business models. This makes it very hard for most e-commerce businesses to blast through the $100,000,000 hurdle. Ask any cataloger how hard it is to blast through $100,000,000! Now try doing it with 2/3rd the repurchase rate for 1st-to-2nd time buyers. E-commerce growth is easy up to $10,000,000 ... you can use social and SEO and viral marketing and you can get there. Then you need a diversified merchandise assortment to grow to $30,000,000 ... each new customer you get has a lower repurchase rate than customers acquired in the $0 to $10,000,000 range, so you almost have to bump the repurchase rate via a broader assortment. From $30,000,000 to $100,000,000, you move into a marketing realm where you have to start spending money. As you spend money, you cannot afford to churn customers with low repurchase rates - the math simply doesn't work. In other words, you run your five year forecast, and you quickly learn you're going to hit a ceiling. And you run out of easy answers to grow. And retail is about 85%, +/-, of total sales. And you start thinking that retail is a good thing. Conversely, retailers are going to be closing stores right and left in the next five years. Old school retail slowly dies as it is cut off from a younger demographic - while online businesses catering to a younger demographic move into retail. It's retail Darwinism. Retail is going to look very different a decade from now. Get out in front of the trends, friends. ... this one is about Domino's, courtesy of NPR (click here). Here's the best part ... the story is a glowing omnichannel festival of tech love ... but when the NPR reporter orders a pizza using fancy omnichannel technology, guess what happens (not listed in the text of the article)? The order arrives, and the toppings are wrong! Merchandise and Service are being forgotten. We're constantly being told by folks with a vested interest in technology that customers demand flawless technology across channels. The the folks with a vested interest in technology get paid. Customers also demand that the darn pizza arrives as ordered. In fact, that's more important. Much, much more important. There is a lot of room for businesses to simply get the basics right. And customers seem to like it when the basics are executed properly. Why don't the omnichannel advocates talk about getting the basics right? Read the headline, and read the story (click here). The author cheerleads "omnichannel". Of course, the author mentions and then completely ignores the fact that comp store sales decreased in Q3. What happens to us when sales decrease on our watch? We get fired. We've all been there. But in the world of omnichannel, a sales decrease is celebrated. Something is really, really wrong, folks. The breathless praise continues ... here's one for Nordstrom (click here), a company where inventory levels are outpacing sales increases (hint - that's bad news, it means customers aren't buying at company expectations). Our industry picks and chooses the arguments that fit the industry narrative. Dig through the narrative, and look at facts. A fellow consultant called me - asking why catalogers are so "pig-headed" when it comes to testing? This individual was frustrated, because the catalogers the person works with will not test pagination, will not execute holdout tests, will not serve up different versions of the website to different customers, will not test personalization, simply "will not" experiment. "Why is this the case" ... this person asked? Maybe you can answer the question. Contrast the point of view above with what Zulily is trying to accomplish ... a different version of the website for every single customer (click here). Now, the conclusions in the article are completely bogus (tenure on the website drives increased purchases - no - the best customers do everything, and have been around the longest, and therefore, they evolve to high-frequency segments much faster than everybody else - and this happens at companies who never change the website too, and maybe the firm helping Zulily wanted that tidbit put in the article for unknown reasons, that's a topic for another day). But the concept of testing, of trying things, of doing something different for every customer, that's going to pay off, and is valid to discuss. The marketing world is moving in several different directions, simultaneously. 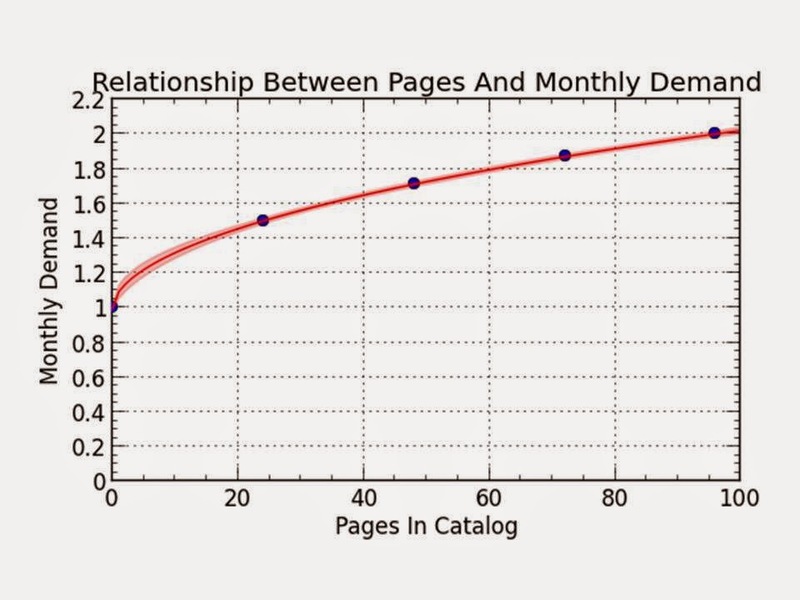 Catalogers are largely "doubling down" - focusing on the 60-75 year old core customer. Here, you do not need to be a sophisticated marketer and you don't need to compete with Zulily - you simply need to offer products that cater to a 60-75 year old customer. Lots of short-term profit to be had here, with undeniable long-term consequences. E-commerce businesses are heading down the Zulily path - an algorithmic version of marketing. Just ask Amazon. You don't do retargeting because it works, you do it because of the data you collect. E-commerce and Artificial Intelligence are going to become the same thing. Here's the danger - algorithms work really well on commodity items at low prices. Algorithms struggle with fashion-centric and excitement-centric business models. Retailers will not focus as heavily on algorithmic solutions - they will lag behind e-commerce folks because of all the compromises they have to make to drive customers into stores. Retailers will have bigger issues - in-store fixed costs are going to demand attention. But retailers will be pulled into tech AI solutions ... there's a reason why Google and Macy's tout online search that drives in-store purchases ... Google wants the searches for $$, they want the mobile searches and online visits to fuel their AI engine. Retailers will be pawns, offline inputs for data-starved AI engines (Google, Facebook, Twitter, IBM, Microsoft, and many others). Mobile will evolve differently than e-commerce - much more of an AI / algorithmic solution that yields convenience, one that yields hyper-personalization among folks under the age of 35. Just use Google Maps for travel, and you'll see where all this is headed. This Is Why Digital Vendors Demand Retailers Become "Omnichannel". Here's the link to the infographic on the right (click here). Look at the four circles at the bottom of the graph. $13 Billion in Mobile Sales. $190 Billion in Online Sales. $1,100 Billion ($1.1 Trillion) in retail sales allegedly influenced by online research. 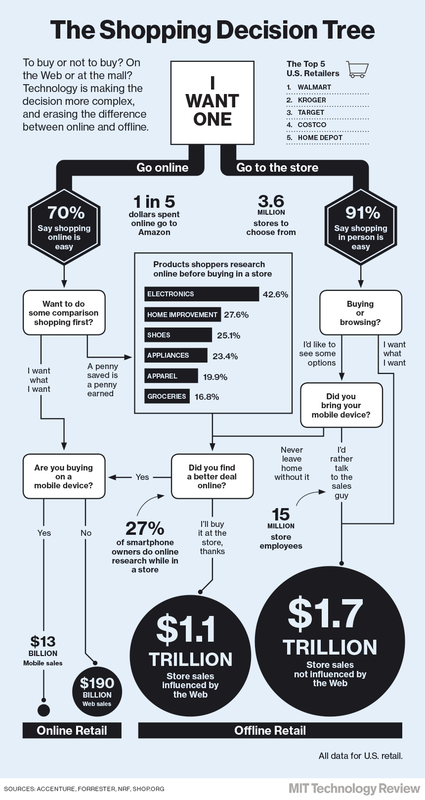 $1,700 Billion ($1.7 Trillion) in retail sales not influenced by online research. That $203 Billion that is Online + Mobile ... let's say that grows at +12% per year for ten years ... compounded ... that gets us to $630 Billion. If the $2.8 Trillion grows at +2% per year for ten years ... compounded ... that gets us to $3.4 Trillion. In other words, Online is constantly dwarfed by Retail ... for a decent amount of time, going forward. This means that vendors looking to make $$$ on digital have their eyes a gigantic amount of Retail volume. If they can convince you that Online/Mobile cause Retail to happen, then they can get paid for the paltry Online portion of the total, and they can get paid for the gigantic Retail portion of the table above. Just something for you to think about. There's no doubt Online+Mobile influence Retail. There is minimal proof, if any, that Online+Mobile cause Retail sales to increase ... there's plenty of proof that Online+Mobile divert sales away from Retail, at slow rates. There are two common questions among catalog marketers. How do our demographics and challenges compare to other catalog brands, and how do online businesses deal with these challenges? Clario is telling me that the optimal solution is to reduce housefile catalog mailings by 43%. This isn't optimal, this kills my business? Why are they saying this? Mind you, I compete with Clario (Hillstrom's Contact Strategy), but my answer to #2 above should help you feel more confident about your working relationship with Clario. Clario is telling you what the "optimal" strategy is ... after accounting for your mail/holdout test results (you routinely execute three month mail/holdout tests right ... RIGHT? ), after accounting for attribution rules that factor in mail/holdout test results and matchback results and any other attribution rules they've developed for you, after factoring in book costs, and after factoring in the rate that demand flows through to profit. After all of those factors, Clario tells you what the contact strategy is that yields the most profit. This strategy is going to cost you sales ... it's typical for a 40% reduction in ad-cost to be paired with a 10% to 15% drop in demand (do not believe those who tell you that they can cut 40% of your circ with minimal impact on demand - it's not going to happen). In other words, the optimal strategy is not the optimal net sales strategy - you need to mail more to increase sales. In most cases, we're looking at "optimal" as being break-even short-term profit. If you want to optimize 12-month profit, you may mail deeper to reactivate customers, customers who will pay you back in the next year. You need to clearly communicate your strategy to Clario, plain and simple. If you want to optimize twelve-month profit (and not book-by-book profit), tell Clario that's what you want to do. As an Executive, you know that there is no such thing as an "optimal answer". No such thing. There is a continuum of answers, and all answers have pros and cons. In the graph above, if you accept the optimal answer, then you cut circulation by 65% ... and you'll reduce the 12-month buyer file by 10% to 15%, and your business will contract year-after-year-after-year. That may not be optimal, unless you have a strong customer acquisition program in place. With co-op performance where it is, catalogers do not have strong customer acquisition programs in place if co-ops are responsible for more than 40% of new customers. You are paying Clario a fortune ... usually 2x-4x what you'd pay me to do comparable work. Ask Clario to create the graph at the top of this post ... have them run a dozen different scenarios at different levels of "optimization", then invite Clario in at your cost to educate Clario how your business works. Tell Clario that when they demand you optimize your business that you'll have to liquidate six months of merchandise and that is "not an optimal outcome". Teach Clario how the dynamics of your businesses work. And then listen carefully to the twelve different optimization outcomes Clario can simulate for you. 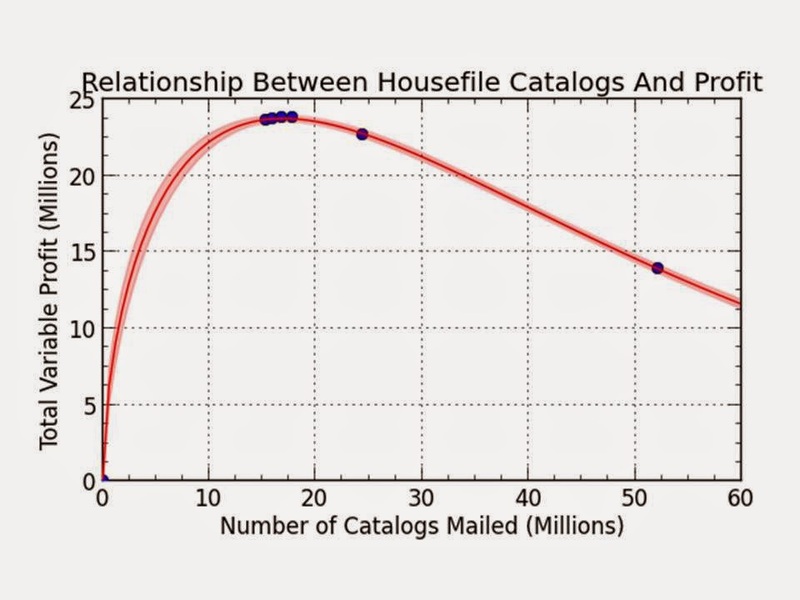 Think carefully about why the optimal outcome requires so many fewer catalogs than you are currently mailing. Anytime Clario is telling you to greatly reduce circulation, they are not telling you to kill your business - they are telling you that the customers who shop from your business are different than they used to be, are more online-centric, and no longer need catalog saturation to generate volume. Clario is telling you that your business has changed. They are telling you that the world has changed. Why do you choose to argue with Clario? Why not listen to them? As for the employees at Clario? It's not optimal to have your primary competitor defending your business model for you. I defend you, of course, because it is the right thing to do. Please, please, please, communicate better with the swath of your client base who call me in frustration. Show your clients multiple solutions, and let your clients choose what is right for them, as opposed to arguing over an ideal "optimal" answer. Need help with issues pertaining to Clario? Email me now (kevinh@minethatdata.com). Have you read this ditty about Chicos (click here please)? I've talked extensively about retail ... as e-commerce takes over (not next year, but over time), pressure is placed on the profit and loss statement. Given that so many retailers owe a ton of debt on retail stores, there is double whammy about to hit. In other words, it will get harder and harder to generate profit in a physical retail store, while at the same time, the expense structure of the store is saddled with debt ... interest and principal payments that do not change. So if you have fixed debt payments and reduced income, something has to give. In the article, the future of retail is clearly articulated. Stores are going to get smaller. E-commerce must pick up the slack to cover the debt. Only best sellers will be made available. An assumption is made ... customers will enter a store, not find what they want to purchase, and then be perfectly happy shopping online while standing in the store chatting with strangers who instantly become dear friends. The online purchase may or may not be credited back to the store. The assumptions are the biggest piece of this puzzle. We hear this all the time ... we assume that if the customer doesn't find what s/he wants, s/he will buy it online while standing in the store. With a 96 page monthly catalog, $2.00 million is generated that month. With a 72 page monthly catalog, $1.86 million is generated that month. With a 48 page monthly catalog, $1.71 million is generated that month. With a 24 page monthly catalog, $1.41 million is generated that month. Without a monthly catalog, $1.00 million is generated that month. Without a catalog, half of the demand flows online anyway. This, then, is the secret to the alleged omnichannel movement. This is the theory. If the store gets smaller (or even disappears), and if only best sellers are offered in the store, the theory suggests that customers will still spend $1.86 million, or $1.71 million (instead of $2.00 million), even though the store is 75% or 50% the size it used to be and only offers best sellers. The theory is that the customer will, even if standing in the store, shop online. The theory suggests that it is ok to have the entire assortment online, only selling best sellers in-store. Theory does not equal reality. But the theory could be proven correct. That's what makes work so much fun!! Why Is It So Hard To Find New Customers And Reactivate Lapsed Customers? Some Numbers, Please! Here's something I ran across in a recent analysis. The metric is a simple one ... percentage of demand at full price (click here to pick up your copy of Hillstrom's Diagnostics). New Buyers = 46% Full Price. Lapsed Buyers = 41% Full Price. 1x Buyers Last Year = 37% Full Price. 2x Buyers Last Year = 33% Full Price. 3x Buyers Last Year = 28% Full Price. 4x Buyers Last Year = 21% Full Price. 5x+ Buyers Last Year = 18% Full Price. New Buyers = -15% vs. Last Year. Lapsed Buyers = -8% vs. Last Year. 1x Buyers Last Year = -2% vs. Last Year. 2x Buyers Last Year = +1% vs. Last Year. 3x Buyers Last Year = +3% vs. Last Year. 4x Buyers Last Year = +4% vs. Last Year. 5x+ Buyers Last Year = +5% vs. Last Year. I keep seeing stuff like this ... companies give the "best" customers all the promotions and sale purchase opportunities and liquidation opportunities. Not surprisingly, folks hang on to better customers. The CRM folks demand that only best customers are rewarded, and we listen. Either don't discount, or discount to everybody equally, if you want uniform outcomes. We're causing our own problems, folks!! Go run this query on your own business. Right now! Go do it. What did you learn? And if the numbers look like these numbers, well, maybe you just learned why you cannot acquire new customers anymore. Do you see the image on the cover of Hillstrom's Diagnostics - available soon from an Amazon website near you? That's the Snake River - my favorite river, if I may be so bold. It begins near Yellowstone National Park, hops across Southern Idaho, forms part of the border between Oregon and Idaho, defines a portion of Southeast Washington State, then merges with the mighty Columbia River at The Tri-Cities. Here's the thing with the Snake River. You can stand near Twin Falls (where the image on the cover of the book was taken), look down, and surmise that "all is good". Looking at the Snake River in Twin Falls is a lot like evaluating an omnichannel campaign. However, salmon born in the Snake River exit into the Pacific Ocean nearly a thousand miles away in Astoria, Oregon. There, salmon feed endangered Resident Orca Pods (J, K, and L). In recent years, there aren't nearly enough salmon to feed the endangered Orca Pods, causing greatly reduced numbers. In other words, you can do everything right in Twin Falls, and you can measure that you're doing everything right. And yet, the outcome, in Astoria, is lousy, causing an endangered species of Orca whales to become even more endangered. Such is the case with omnichannel marketing strategies. The vast majority of our measurement techniques are campaign-centric, like looking at the Snake River in Twin Falls. We measure what happens at a point in time, in one location. We do not measure the impact on the total ecosystem, do we? In retail, omnichannel is slowly killing store performance - the exact opposite of the desired outcome. Our digital marketing tactics cause customers to sit at home, browsing, not traveling to a store to shop. Worse, when the customer shows the slightest interest in buying something, we exhibit no patience for the online-to-retail experience to happen. Instead, we demand that the customer empty that shopping cart into a viable purchase transaction - now - NOW! That has to happen online, further decreasing the in-store buying opportunity. After a decade to training the customer to sit at home and shop, is it any wonder that we're fretting about foot traffic in stores? Hillstrom's Diagnostics help the retailer, cataloger, or e-commerce maven to understand if there are specific productivity issues or new+reactivated customer issues. Across forty companies during the past two years, these two issues (merchandise, new+reactivated customers) are the dominant challenges facing my clients. The booklet will help you diagnose your specific problem. If you really want to see the (complete lack of) power in the omnichannel business model, take a look at what happens in a market where you decide to close a store. The secrets to your business happen in those markets. 2012 Retail At Store = $1.00 Million. 2012 Retail Via Other Stores = $0.40 Million. 2012 E-Commerce = $0.20 Million. 2013 Retail At Store Closed = $0.50 Million (closed mid-year). 2013 Retail Via Other Stores = $0.50 Million. 2013 E-Commerce = $0.20 Million. 2014 Retail At Store Closed = $0.00 Million. 2014 Retail Via Other Stores = $0.60 Million. 2014 E-Commerce = $0.25 Million. Let's compare 2012 to 2014. 2012 Market Demand = $1.60 Million. 2014 Market Demand = $0.85 Million. We lose $0.75 million. The closed store generated $1.00 million. In the omnichannel future presented to us by the experts, customers are shopping everywhere, using all devices and spending a fortune. Then you close a store, and 75% of the demand from that store simply disappears. Gone. If omnichannel had any power whatsoever, then the demand would still be captured, right? The customer wouldn't quit shopping, the customer would move to another store, or would transition purchases online. That's almost never what happens. When a store closes, one of two things usually happen. 75%ish of the sales disappear, with the remaining demand recaptured among existing stores or e-commerce. In a multi-store market, 50%ish of the sales disappear, with the vast majority being recaptured by existing stores, and a minority of demand flowing back into e-commerce. Why pay attention to this trend? As retail demand leaks out into e-commerce (because retailers will work hard to become "more digital", and will continue to siphon demand out of the in-store experience into e-commerce), individual stores will look unprofitable. This will cause CFOs to demand that unprofitable stores be closed. Then, after unprofitable stores are closed, demand will not flow back out into other channels, growth will stall, and all sorts of chaos ensues. Run the query for yourself - look at what happens to e-commerce demand in markets where you close stores. This is the future that omnichannel is going to give us, if it continues down the current path.